Thanks to Julie Bookman and Encore Atlanta for this article about our festival this summer! 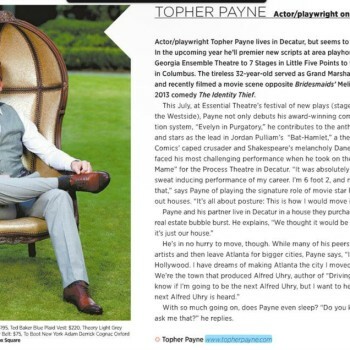 July/August 2012 – Simply Buckhead: Topher Payne: Actor/Playwright on a roll. Actor/playwright Topher Payne lives in Decatur, but seems to be practically everywhere. In the upcoming year he’ll premier new scripts at area playhouses from Roswell’s Georgia Ensemble Theatre to 7 Stages in Little Five Points, to the Springer Opera House in Columbus.